Sechelt Accommodations - Places to Stay!! Sechelt accommodations are a little more varied than what is available in the Gibsons area. Sunshine Coast accommodations vary greatly from community to community, so be sure to check out the other sections of this website for references to where to stay. Porpoise Bay Provincial Campground - A gorgeous spot! This provincial campground is situated on waterfront on Sechelt Inlet. There is a sandy swimming beach and the sunsets are spectacular. 89 campsites in all, this is an excellent base camp for paddlers wanting to explore Sechelt Inlet. There are local rentals of kayaks and canoes in the village of Sechelt. There are showers and site rental is between $10-$20/night. 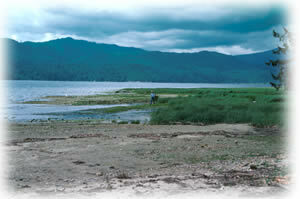 Porpoise Bay Provincial Campsite is approximatley 4km from the village of Sechelt and is located on Sechelt Inlet Road. Bookings for this campsite can be done online through the provincial governments camping website. Reservations are highly recommended from June - September as it often fills to capacity. There is also a private campsite, which is not on the water on Sechelt Inlet Road, apx 1.5km from Sechelt. Bayside Campground can be reached at 604-885-7444. The great thing about this Campground is that there is a fire pit at each site. You wont find this in a Provincial Campground. B&B's are scattered throughout the village, and there is a huge variety available. Check out Sunshine Coast Bed & Breakfast Cottage Owners Association. A beautiful spot to stay in the area is the Tuwanek Hotel and you can access their suites through the B&B association link above. I have had many friends say they have loved their stay at the Tuwanek Hotel.